Apparently while we were away we had a couple of house guests. I'm pretty ticked about it though because the were uninvited and left a mess in our kitchen. As we were coming in the house I was about to put MAe down on the tile floor when I spotted him scurrying away. Blondes totally freaked out and ran into the other room. I'm not too scared of creepy crawly things, but yeah, I totally screamed for The Man. He came to my rescue and killed the bark scorpion as it tried to get away. After scouring the house over, looking under things, and feeling my skin crawl all over we went back into the kitchen to find Scorpy's lady friend frozen on the floor (probably scared and in shock that she had just witnessed her lover's death). I (feeling a little braver) killed her on sight. For the past few weeks we have been finding dead bugs on the tile. I kept wondering why I never saw them until morning when there they were...dead on the floor. The Man sprayed our perimeter today and hopefully we will not see anymore of these disgusting creatures. EEEEEEEK! I guess it really is that time again! I will have to show you our blacklight that Darren uses to walk the perimeter every night to kill said creatures before they have a chance to enter. Last summer we had 20+. Yeah, I just about lost my mind. oh my. 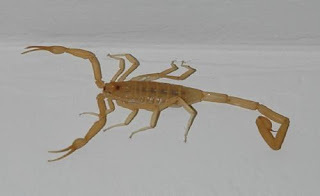 we don't even have scorpions here and I'm afraid to go to bed. First of all, I love that you actually screamed for Eric to come and help you. This being the same person that covered a bat with a bowl so he could go back to sleep. I thought for sure you would be the one to handle these types of situations in your household. Secondly, I agree, that is no fun to come home to. Hopefully, you got the main culprits and you can rest peacefully now. GROSS! Good luck with those buggers. yick! that is pretty nasty! how many babies do they birth at once? do they lay eggs, or have live births? i have to admit i did cringe. is that a picture of one in your house? Big enough to BBQ. Taste like chicken.